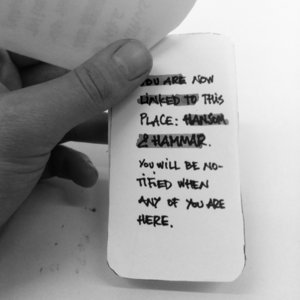 This project aim was to get really involved with the potential users: I tried ethnographic methods applied to design. Another important aspect for me was to explore and try new creative methods. 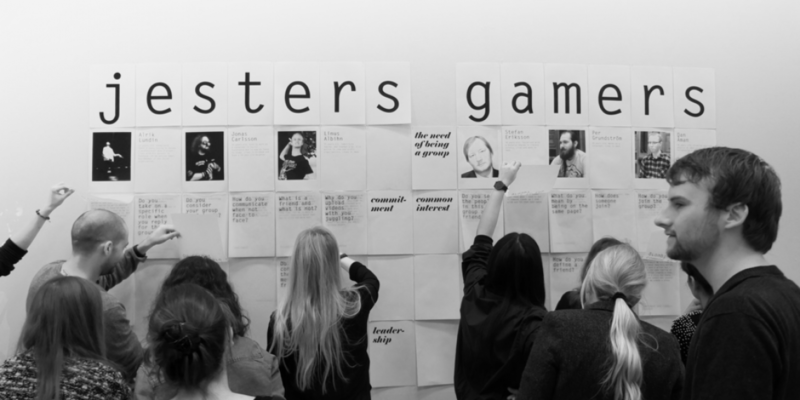 In this sense, the focus was in revealing and making visible group dynamics and generating ideas around it. Interviewing and observing people can be complicated, as there are many aspects to consider before having the initial contact with people. In our case, we found it necessary to discuss who we were interested in talking with and how we would approach the interviews. Rather than going for University Students like ourselves, we decided to focus on groups with a shared interest who met weekly. We decided to focus on groups with a shared interest who met frequently. It was important to get to know them as people rather than users. We had two sessions with each group, where the first interview was done in a focus group format with a duration of roughly 2 hours. The second session was conducted as a more individual talk, as we then could ask for personal reflections on topics from the first interview. In general we kept the interviews semi-structured, as we wanted the format of the interview to feel natural and not scripted. This is a video we edited trying to condense the dynamics we found in the group. The Jesters are from the beginning a small group of friends that used to hang out at a local café. At the moment the jesters has turned into a formal organization partly founded by the municipality’s youth program. This is the video that ries to show them as a group. We aimed for getting to know them as deeply as possible so we interviewed each group twice and in almost all cases as a group and also each member individually. We stayed with them learning to do some acrobatics and playing a short role play game in order to share their interests and be closer to them. During the interviews, concerning group dynamics, we were surprised of how intimate some answers were, how much they opened themselves in front of us and how honest they were (we think) telling us their private stories. We also grasped a bit of their group dynamics; we wanted to know what is it that keeps them together over the years. It called our attention how important routines were for them as well as a minimum commitment with the others. We also had the chance to have a glimpse of their different views on the same topic and some small conflict points between members. We observed some unwritten rules in both groups and both groups considered themselves as open. Finally, we think that there were different roles played by the different members and that those roles changed over time for different reasons. Concerning asynchronous communication, we had some insights about their patterns and purpose of use. For example, how often, why and what for they used e-mail, Facebook, Skype and other applications like Dota 2, Snapchat. The initial research was presented in a workshop format with classmates, teachers and tutors. We picked out key insights from or time with the two groups and asked others to go through the same material and pick out patterns or interesting topics. To explore or initial idea and take the project further we created a series of scenarios and use cases. Through low fidelity evaluation prototypes and discussions with students and tutors did we then explore parts of our scenarios. 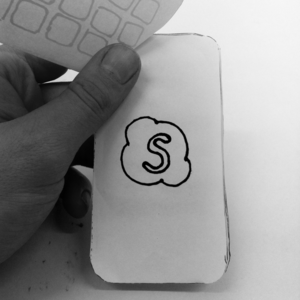 We created multiple paper interfaces (smartphones) with different approaches. We gave them to other students to try them out, we explained a scenario and asked them to openly reflect around the experience. We developed, reworked and changed our initial concepts through sketching and long discussions testing our new solutions by simple hand drawn wireframes made into interactive mockup using the proto.io tool. This lead up to our final design. An added function to the regular Skype interface. Four methods were used to structure the ideation, as it was important for us to explore different methods to learn about their pros and cons. The four we ended up trying were: A Heuristic Ideation Technique (Tauber, 1972), 6-3-5 (Rohrbach, 1969), Lateral thinking (Creativeminds, 2002) and Forced conflict (Creativeminds, 2002). A benefit from these methods was that we managed to think beyond the brief and explore inspiring thoughts. Instead of being fixated on the topic of asynchronous communication: Feeling & Expression, we wanted to dive in to our data and exhaust our minds from all possible ideas. When the ideas started to come short, we moved on to categorizing the ideas into meaningful topics. We quickly did an affinity diagram (Rogers, Sharp and Preece, 2011, p.286), knowing that some categorized naturally would overlap and had to be relabeled as we moved on. The initial categories spanned from emotionless communication to enriching the group dynamic. But it helped to create an overview of the core of the individual idea, which was an important step towards choosing four ideas for our concept gateway presentation. 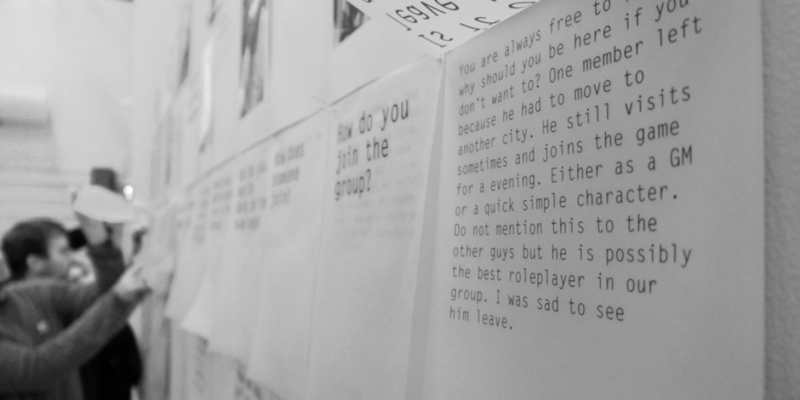 Time and space conditional messages was one of the three categories that we brought with us to the concept gateway. Within this category we had two ideas, that differed in how users were supposed to engage with time and space. Group visualization was the second category, which focused on how group dynamics could be embedded into text messaging. The video questions why conversations are just a list of bubbles, and we propose ideas on how to move away from the traditional interpretation of messaging. We know why most people use skype today. It is to keep in touch with family and friends far away. Skype is not necessarily used when you are actually going to meet them. 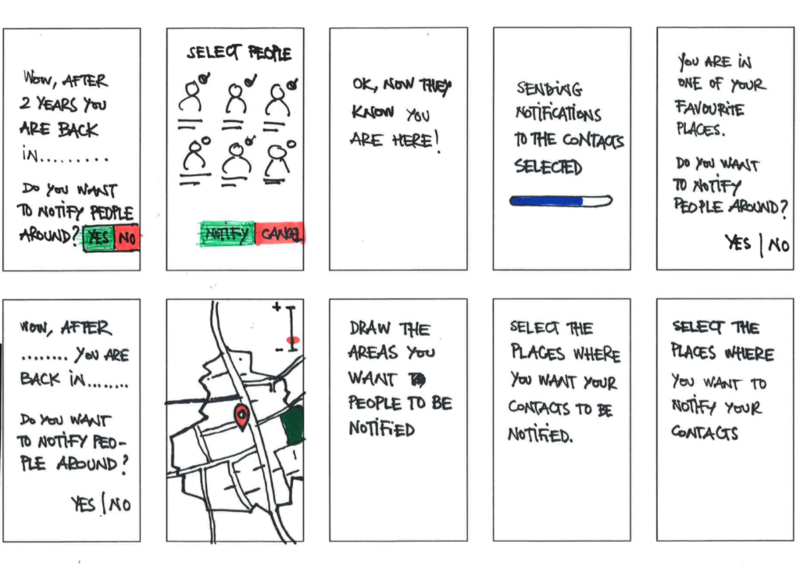 Our concept builds on the geolocation information, the patterns of you and your contacts movements. 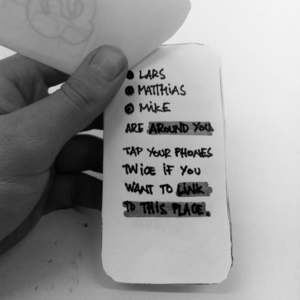 Suggesting that you notify or contact your friends when you happen to be in ‘close’ proximity. We were long debating whether to make a standalone application or an added function to the already existing Skype. In the end we decided to use the Skype framework and ad our idea to it. Mainly because a lot of the messaging functionality we needed already exist in the standard Skype application. 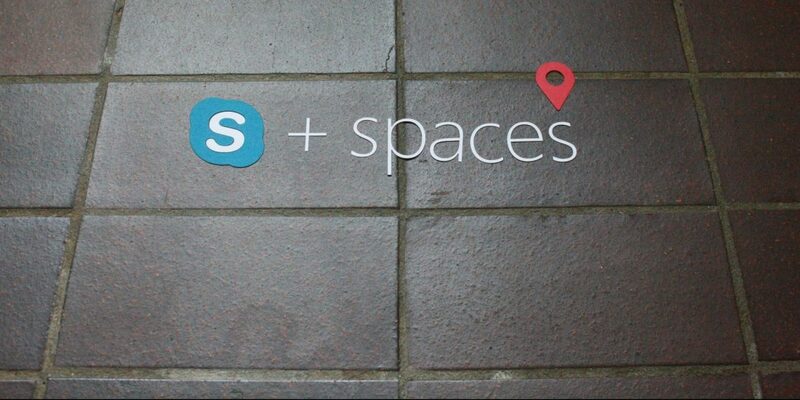 The changes we made were to replace the favorites tab inside the Skype mobile app with what we call Skype ‘spaces’. The spaces tab mainly consist of two screens. What you first see is a map of the general area (where you are at the moment). A map that also shows you if you have any contact nearby and roughly how far away they are from you. Here you can zoom in or out to select groups of people (or tap individuals for more precise targeting). You can also switch to a second screen where you instead get a list of your contacts nearby. When you selected the people you want to contact you press the ‘notify’ symbol (a old-school bell) to send out a general notification to your selected contacts. After a short animation (to clarify that a notification is sent out) you end up at the original ‘recent’ tab. All responses you get from the notification will be shown there. The notification itself should be a generic message that you can (if you want) customize to something more personal. It shows up like a regular conversation only with some graphical changes to the look of the notification. If you are the receiver you get a push notification telling you that your friend is back in town. You can either choose to swipe for a quick response (Yay! ), respond to it like regular text message or just ignore it. The quick response originally came from an earlier concept and was transferred here because we felt that it was important to easily respond to this notification. It’s not easy to take contact with someone you not seen in a while so even if you don’t have any suggestions for meeting up, it’s nice to quickly tell someone you are positive to them coming back. We also added a settings menu specifically for the spaces function. To give more control to the people that want it and open up for a more creative use for our basic function. You can here manually add spaces or areas where you want to be asked about notification. You can also inactivate certain areas. This gives the user the opportunity and power to mold this tool into something unique for them. Hi, I am an intreaction designer with a background in Computer Science and Visual Communication. Research through design, ethnography design and participatory design are my main methods of working. I have a passion for designing learning experiences <nd making visible the invisible.